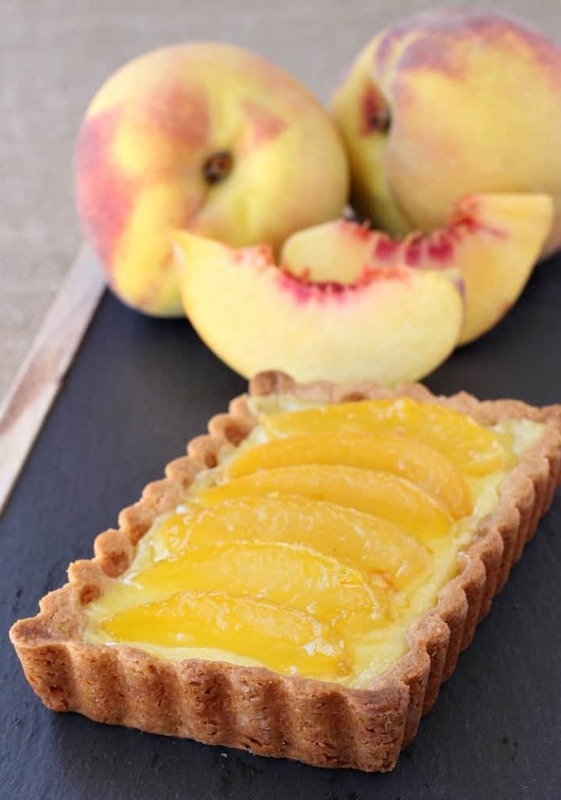 This Peach Custard Tart is prefect with your morning coffee or after dinner for dessert! As I’ve mentioned before, I’m not much a of a baker. I keep mentioning it because I want you to know that if I’m posting a dessert recipe here, you can totally make it. If I can, you can – no doubt. 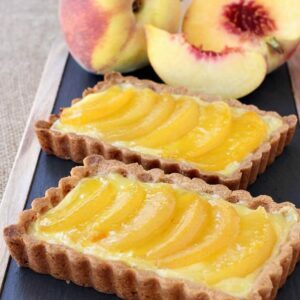 Even one that looks as good as this Peach Custard Tart. 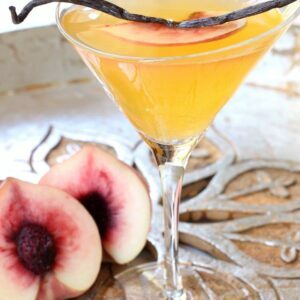 You only need a few ingredients to make this dessert come together and you can even use frozen peaches if fresh peaches aren’t in season yet. So coffee for my wife is a pretty big deal. Like, you can’t really talk to her much before she’s had at least one cup. Then she’ll work her way up to three, but after one she can get a few words out. 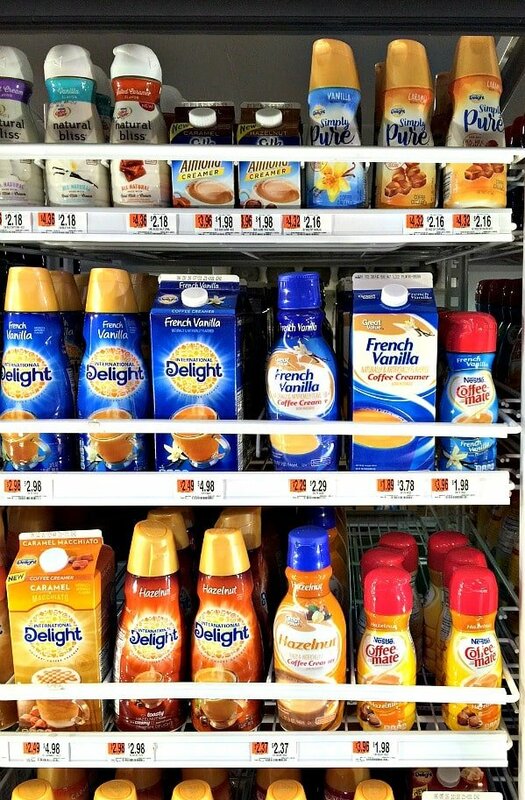 And then there’s the creamer. She loves using International Delight Simply Pure Coffee Creamer. She like all three flavors – the vanilla, hazelnut and caramel but uses the vanilla flavor the most – but what she likes about it the best is that it’s made using real milk, cream and sugar. A big deal for her since she gave up artificial sweeteners last year. So for her it’s coffee with her favorite creamer in the morning and for me…well, it turned out to be an ingredient swap. There’s certain things in your house that you’re not usually out of, right? One of those things for us is heavy cream. We always have it. For cocktails, making our son’s favorite tomato soup, it’s just always in the house. Except for the day I went to grab it for this tart and we didn’t have any. So then I figure, why not use my wife’s creamer? Since Simply Pure is made with real milk and cream, why not? And it’s already got the vanilla flavor I need for the tart so we’re talking a win-win here. The other swap put I used for making this tart is white whole wheat flour instead of plain white flour. We started buying white whole wheat flour for certain recipes but now we seem to use it for everything. A little healthier of an option but we also like the flavor. So here’s the basics for this tart…you’re going to make a simple tart crust then bake it for about 10 minutes. Then for the pastry cream it’s just milk, Simply Pure Coffee Creamer, a few egg yolks and sugar. All whisked together and thickened with cornstarch. 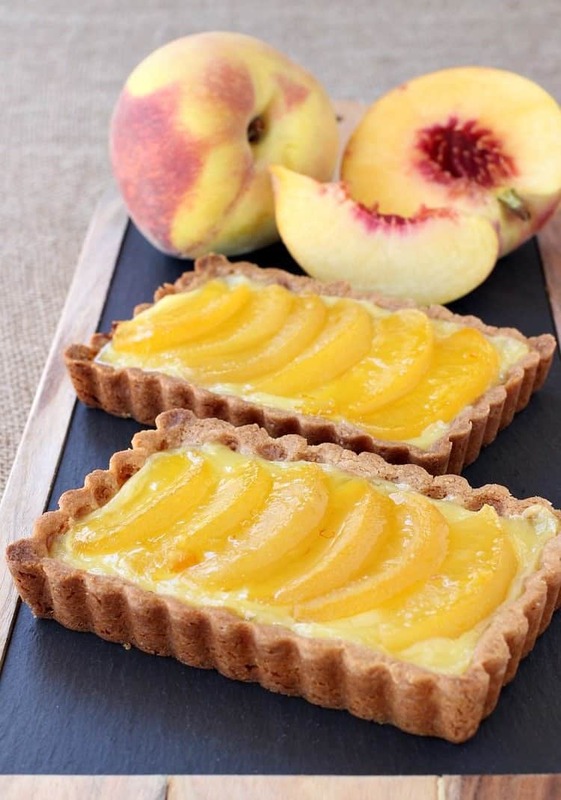 Once the crusts are baked, pour in the pastry cream and top with sliced peaches. Bake for 30 minutes then brush the tops (while they’re still warm) with peach jelly and let cool. 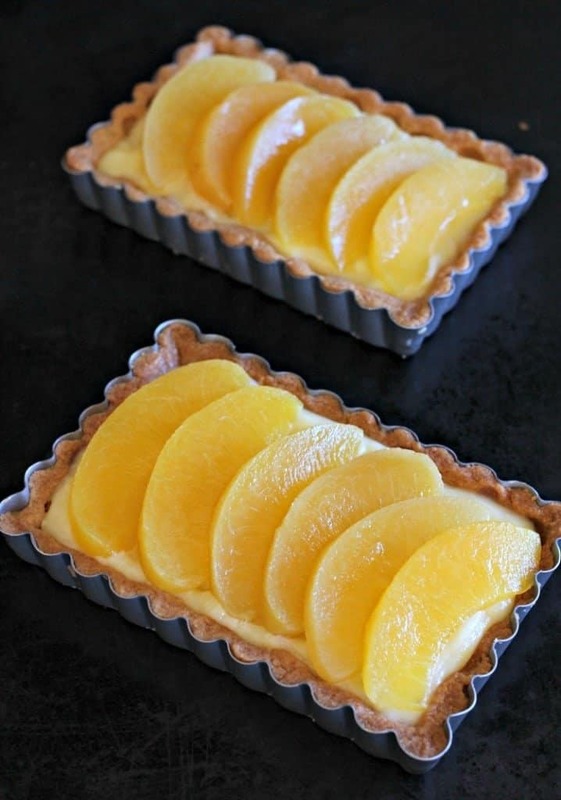 This Peach Custard Tart is good at room temperature or chilled – and no one in my house would ever say that these tarts couldn’t be eaten for breakfast too. Serve up the tarts with a big cup of coffee and your favorite International Delight Simply Pure Coffee Creamer and you’ve got a winning combination! Start by making the crust. In a stand mixer, cream together the butter and sugars for 5 minutes. Slowly add in the flour and salt until just mixed, then form into a ball and wrap in plastic wrap. Chill in the refrigerator while you make the pastry cream. 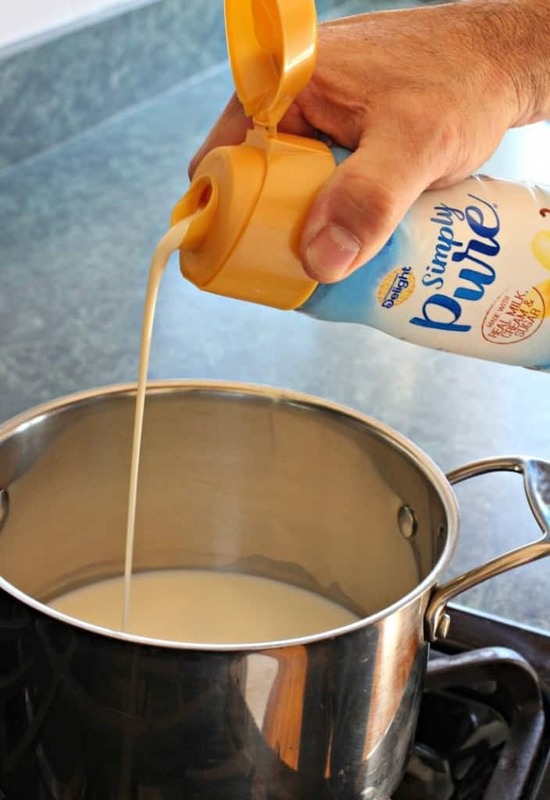 Add the milk and Simply Pure Coffee Creamer to a pot over medium heat. Whisk in the egg yolks one at a time until completely mixed in. Whisk in the sugar and then bring to a simmer. In a small bowl, mix the cornstarch with 1/4 cup of the milk mixture from the pot until there are no lumps. Slowly pour the cornstarch mixture back into the pot while whisking until it thickens. Cook for one minute, whisking then remove the pot from the heat. Roll out the dough on a floured surface until it’s a little larger than your tart pan. You’ll want the dough pretty thick, about 1/2″ so you get a nice, thick crust. Lightly press the dough into the tart pan, trimming off the edges when you’re done. Poke the bottom of the crust with a fork so it doesn’t rise. Fill the crust with the pastry cream and then layer on the sliced peaches. 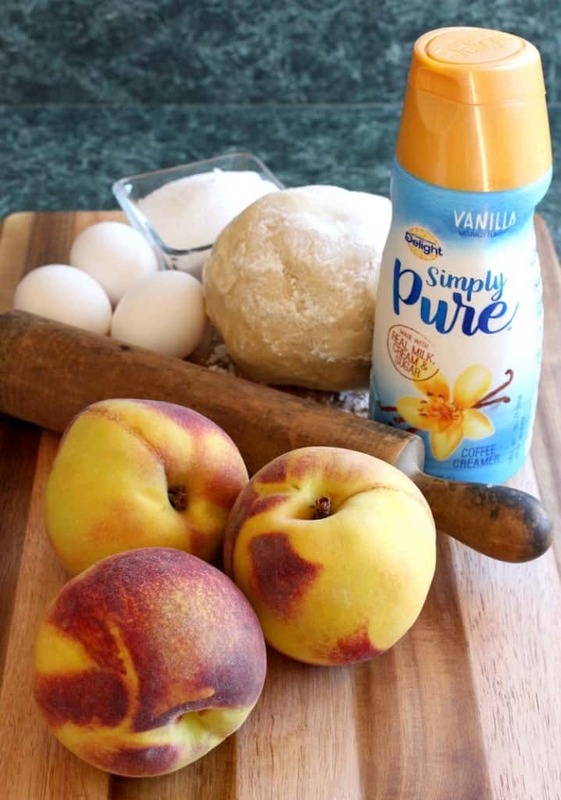 Bake for 30 minutes until the peaches are slightly brown on the edges and the pastry cream is bubbling. Brush the tops with the jelly and let cool.